Paddington Bear visiting Museo Larco in Lima, Peru. The number one place to visit is without doubt the magnificent and wondrous Inca ruins at Machu Picchu. It’s origins and purpose are yet to be fully defined but what everyone can agree on is that your visit will leave you wanting to know more and more about the Inca people. Why do we love it so much? We love the different ways you can explore the ruins. Take the famous Inca Trail and arrive after a 4 day trek through amazing Inca villages while taking in spectacular mountain views. But be quick, spaces fill up quickly! You could also spend a night in Machu Picchu Town, the small town at the foot of the ruins. My favourite hotel here is the Inkaterra Machu Picchu Pueblo Hotel. A beautiful rustic hotel, set in tropical gardens. A great place to relax for a night after a busy few days of exploring… If you’re going to treat yourself, this is the place to do it! Now that you’re relaxed, you can visit the ruins for a second time exploring at your own pace, or walk up Huayna Picchu – the sugar loaf mountain that overlooks Machu Picchu – for some of the best views and photo opportunities. The Peruvian people are some of the friendliest I’ve ever had the pleasure to meet. Everywhere I went, I was welcomed by the locals I met during our excursions, those at the hotels, and of course by the wonderful guides I had throughout my trip. We receive great feedback from customers about the guides that they met along the way. Look out for Elvis when visiting Machu Picchu. While everyone was friendly and welcoming, two occasions are particularly memorable. During our time on the Sacred Valley excursion, we stopped in the town of Chincheros to visit their local church, a fusion of Spanish and indigenous culture. The many frescos and paintings familiar to Christianity are displayed along with native local beliefs, subtly represented by golden suns and silver moons. Afterwards we were treated to a demonstration at a workshop on how the local women weave and dye clothing. An entertaining, relaxed and welcoming experience. We drank coca leaf tea, tried our hand at weaving and laughed with the local women who were all keen to show us their traditional way of living. In my opinion, the friendliest people live on the floating Uros islands at Lake Titicaca, where I met the youngest and most charming sales person in Peru. Three year old Stephanie, was making sure I didn’t leave without a pretty bracelet she had chosen herself. The local people open up their homes to tourists as way to earn money to help preserve their way of living and keeping their community together. A fascinating place to visit, made even more special by the people you meet. One of the best experiences while travelling is tasting new and delicious food along the way. Peru is going through a food revolution right now and you will be spoiled for choice. Particularly in Lima and Cusco where you will find everything from local restaurants to Michelin star quality.The ceviche at the El Pardo Doubletree Hilton hotel in Lima is particularly tasty and always made fresh in front of you. I recommend doing your research before you go to make sure you hit the good spots during your free time. Peruvians enjoy large lunches and have smaller meals in the evening and remember to eat light when first arriving in Cusco to help combat the effects of high altitude. Expect lots of tasty soups, chicken, sea food, potatoes and quinoa during your stay. You’ll learn a lot about how fresh produce is cultivated in Peru and how the Incas experimented using microclimates to their advantage during our optional excursion to Maras and Moray. 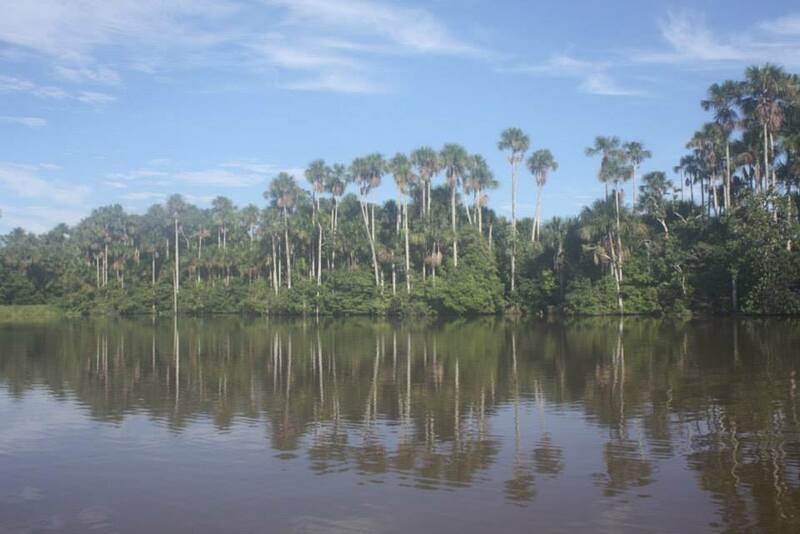 Much of Peru lies in the Amazon rainforest and the town of Puerto Maldonado is where we begin our journey into the jungle. Easily accessed from Lima or Cusco, I enjoyed three wonderful nights here immersed in the jungle – but in comfort also. The tiny airport is not Heathrow (thankfully!) but can be busy with tourists all arriving on the same flight. Our guide was waiting outside with a sign and took us to the local office to process our paperwork, and offered us a refreshing cool towel and welcome drink, before we headed to the river port. After a short canoe journey upriver we came to the Hacienda Concepcion, our lodge for the next 3 nights. I’ll be honest, I had some slight trepidation about what the jungle would be like. Would there be many insects? What do you mean there is no internet?! Limited electricity? I quickly discovered that these trepidations were unfounded. There are insects, but a long sleeve top and some mosquito spray is good enough when you’re out exploring and the rooms and cabañas are fully enclosed. The limited electricity is not an issue. There was plenty of time to charge my devices and enough light and hot water when needed. The peaceful surroundings, the jungle noises and the excursions make you forget about emails, facebook and indeed the outside world in general. It can all wait. I’d recommend taking a cabañas for extra privacy at the Hacienda Concepcion or stay at The Reserva Amazonica for even more comfort and to take advantage of a wider selection of excursions. After a worthwhile 3km trek and visit to Lake Sandoval, spotting caiman along the way a hot shower, a drink at the bar or a relaxing massage is very welcome. Or for those who want to go deeper into the jungle, try the Refugio Amazonas or Tambopata Research Lodge. The perfect base to explore the surrounding region including Machu Picchu and the Sacred Valley. Modern day Cusco its self is a busy place, full of restaurants, museums, churches, markets and festivals. It is a blend of colonial Spanish and Inca architecture and the perfect place to spend a few days exploring on your own. You’ll be glad of a few days here to adjust to the high altitude. You should find Cusco a perfectly safe place to walk around, visit one of the many places of interest or buy some souvenirs. I had lunch at a lovely pizzeria overlooking Plaza De Armas, the main square in Cusco where I spent a few hours just watching everyone go about their business. The uber trendy Fallen Angel restaurant is where I found myself one evening for dinner. Our Peru holidays allow you enough time to acclimatise to the altitude, visit many of the places of interest including the famous Qorikancha, the main temple of the Inca Empire and free time to take in all that Cusco has to offer. If you have been inspired by Graeme’s adventures to trace back the steps of Paddington Bear all the way to darkest Peru on your own holiday of a lifetime, you can see a list of all our Peru Holidays here. You can also see more information on all our amazing Latin America holidays here or ordering our brochure. You can also give the Llama Travel office a call at 020 7263 3000.